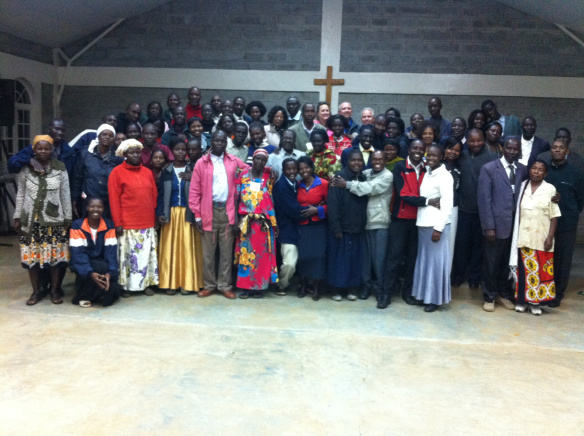 On the 22nd of June, we welcomed our national pastors to Eldoret for our pastors’ conference. We hold these conferences three times each year. We first bring about 14 pastors in on Tuesday night, and then another 15 or 16 on Wednesday night. We spend Wednesday with our closest pastors, receiving testimonies and praying for their needs. The conference starts in earnest with the Wednesday night midweek service. There is one more session that night, then we spend all day Thursday and Friday with the men. We teach on specific topics that we feel are relevant to their needs. This particular conference was a bit different. For the first time, we invited each pastor to bring his wife with him. We wanted to teach them together, with the desire to see their relationships strengthened. 32 married couples came, expecting a great time in the Lord’s presence. The topics included roles in the home, conflict resolution, the marital relationship, and we even dealt with the subject of family planning. Over the years, we have seen that these topics have been one of the causes of strife and confusion in our churches here in Kenya. One of the real highlights of the conference was when Pastor Rob Hendrickson taught on Thursday morning. He dealt with grudges, bitterness, and forgiveness. It was a powerful word, the Lord applying it to almost every heart and couple in the room. After lunch, we had the couples go together to a place where they could be alone and discuss how the morning’s teaching had spoken to each of them. It was a very moving time as you could see brokenness, forgiveness, and tenderness shown to each other. The Lord broke down many walls that afternoon. On Friday morning, Pastor Forbe Carlson spoke to the couples on the subject of a woman’s desire being toward her husband. The first session dealt with the woman’s innate desire to usurp authority and her desire for independence. We discussed her role of supporting her husband, helping him to fulfill what God has called him to do in their church and town. In the second session, we dealt with the other aspect of desire, that being where God places a godly longing in a woman to be loved and to love her husband physically. Knowing that the subject is often taboo in church teaching, we went through the Scriptures showing them that God desires them to love, enjoy, and fulfill each other. This union then creates a strength and bonding that helps them to minister together as a team. Their union provides for the Lord to substantially increase their effectiveness in ministry. In the Friday evening session, Pastors Hendrickson and Carlson were joined by their wives for a panel discussion. They spoke to some of the questions that the couples had, and then discussed the affect that children can have on ministry. Because of many of the cultural traditions, we took them to the need to analyze how many children that they are prepared to disciple. It was a lively discussion, and the couples were thankful for the care that was given to them in these matters. We received testimonies from the couples, and it was quite evident that the Lord had begun a great work in a number of their lives and relationships. It is our prayer that what was begun during these three days will continue to bring strength and balance to our churches here in Kenya, Uganda, and Tanzania. This entry was posted in Uncategorized on August 27, 2014 by Pastor Forbe Carlson.